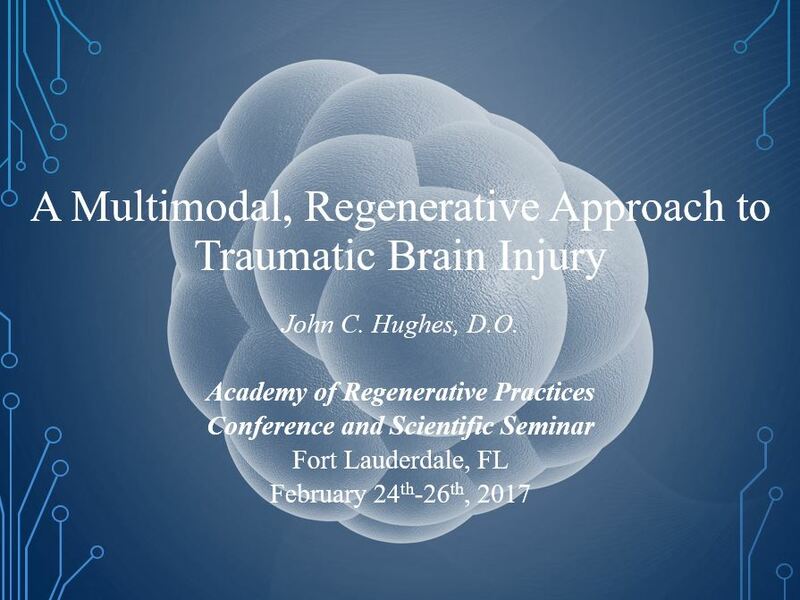 TBI Therapy, founded and managed by Dr. John Hughes, D.O., treats traumatic brain injury (TBI) patients by combining regenerative therapies – including hyperbaric oxygen therapy (HBOT), intranasal platelet rich plasma (PRP) therapy, and intranasal stem cell therapy – with supplementary nutritional modalities. The procedures and protocols used by our Colorado-based TBI treatment clinic are patent pending, uniquely sophisticated, presently scarce, and at the forefront of neuro-regenerative medicine. Most treatments for chronically debilitated TBI patients have involved pharmaceutical drugs, occupational and physical rehabilitation, speech therapy, and cognitive maintenance. Many patients resign to merely manage their condition and gain very little improvement or begin a slow decline of cognitive or motor function. Using Dr. Hughes’ protocol, patients at our TBI treatment facilities will optimally receive HBOT therapies before and after PRP injections or infusions, along with other healing modalities such as cranial osteopathic treatment, IV nutrition and hydration, and other adjunctive therapies to aid in neuro-regeneration. How Does the TBI Therapy Protocol Work? Top 10 Things You Should Know About TBI! Breathing 100% oxygen at increased atmospheric pressures allows the body to absorb about 10 – 15 times its normal supply of oxygen. This “high dose” oxygen can help stimulate the growth of tissue, bone and blood vessels, reduce inflammation, and mobilize stem cells in traumatic brain injury patients. Read more here. Adult stem cells have the ability to divide and generate all cell types of the organ from which they originate. Stem cells can help stimulate tissue re-growth and greater blood flow to the affected areas of the brain. The goal of stem cell treatment for TBI is to replace damaged cells and to promote the growth of new blood vessels and tissues in order to help the brain function at a greater capacity. Read more here. PRP is derived from plasma, which is the “nutrient rich liquid between our red blood cells.” This blood plasma is rich in growth factors, cytokines, and stem cell precursors. What results is an increased amount of collagen deposition for tissue healing in the brain. The growth factors activate stem cells and enhance their activity. Read more here. Brain trauma is characterized by disproportional pro­inflammatory cytokine (e.g. tumor necrosis factor­α, interleukin­1, and interleukin­6) production and release that is associated with increased counter­regulatory hormones. This triggers hypermetabolic and catabolic states, severely impairing nitrogen homeostasis. IV nutrition therapy provides patients with B-vitamins, minerals, vitamin C, glutathione and other nutrients to help restore proper balance in the brain. Read more here. Cranial osteopathy addresses the fact that the central nervous system, including the brain and spinal cord, has subtle, rhythmic pulsations that are vital to health and can be detected and modified by a skilled practitioner. This rhythmic pulsation can be blocked in brain injuries such as with traumatic births, sports injuries, etc., and cranial therapy can help return pulsations to a regular rhythm. Read more here. This diet produces ketone bodies from fatty acids and has long been used to treat epileptic children. One aspect of this hypothesis is an associated modification of the tricarboxylic acid cycle to increase the synthesis of the neurotransmitter gamma­aminobutyric acid (GABA), leading to neuronal hyperpolarization and less of the neuroxcitatory glutamate. Read more here. Adjunctive therapies are available from associated practitioners which include at-home hyperbaric chambers, sensory deprivation float tank, acupuncture, massage / structural integration rolfing, musculoskeletal PRP injections, chiropractic / cranial facial release, cranial osteopathy / osteopathic manual therapy, and exercise with oxygen. Read more here.